George Bradley is one of those included in the Bottesford ‘church list’ of WW1 servicemen. 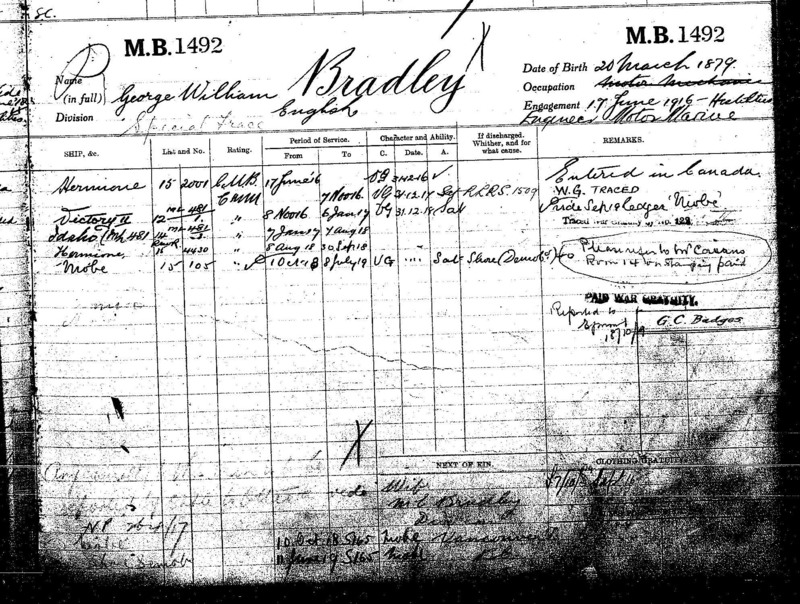 George William Bradley was born at Elton on the 20th March, 1879, son of Charles and Ann Bradley. 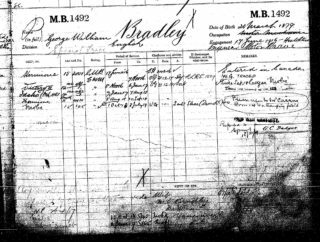 Charles Bradley, a domestic gardener, was born in Elton in 1847. Ann was born in Redmile, in 1846. In 1881 there were four children in the family: John (aged 8), Jane (6), Charlotte (5) and George William, aged 2. Unfortunately their father died three years later, in 1884, leaving an estate of £135.18s. By 1891, Ann had moved to Bottesford with Charlotte and George and was working as a seamstress. They lived on the High Street, close to the Lentons at Chestnut Farm. Ann and George William were still on the High Street in 1901, close to the premises of W. Miller, the butcher. Ann now described herself as a dressmaker and George as a general labourer. In 1911, George William Bradley, now aged 32 and working as a platelayer on the Great Northern Railway, was at 36 High Street, with his mother. Information on his service record (see below) implies that he traveled to Canada between 1911 and enlisting in 1916, but no emigration record has been found. 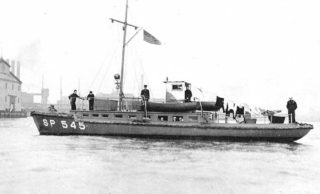 George William Bradley served in the Royal Navy Volunteer Reserve (RNVR), as MB/1492 Motorboatman. His RNVR Service Record sheet confirms that he joined on 17 June 1916 as an “engineer motor marine”. The first entry in the Remarks column of this record sheet says “Entered in Canada”, seeming to indicate that he enlisted in Canada, presumably having emigrated there between 1911 and 1916. Moreover, his next of kin was given as his wife, M.E. Bradley, who lived in Vancouver. He crewed on board vessels named the Hermione, Idaho and Niobe, as well as having a spell at Victor II, the shore base at Portsmouth. His last posting, on the Niobe, ended on the 8 July 1919, and the final date on the record is 18th October, 1919. He had been promoted to Chief Motor Mechanic and was awarded the Victory Medal and the British War Medal. HMS Hermione was a protected cruiser, employed as a guardship at Southampton from 1914 before becoming a headquarters ship for motor launches and coastal motor boats. HMS Niobe was a ‘protected cruiser’ launched in 1897 which in WW1 became part of the Royal Canadian Navy. 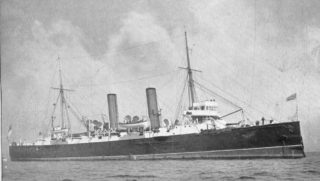 She was seriously damaged in December 1917 when an ammunition ship Mont Blanc exploded, killing several members of Niobe’s crew, including a party of seven who had been attempting to board the Mont Blanc and scuttle her. She remained in service as a depot ship, which is when George Bradley was aboard her. This was less than two years after he left the Niobe, which means that he must have returned to Bottesford after leaving the navy, but there is nothing to indicate whether his wife was there when he died.In fact, the absence of any mention of her suggests that she was not present. A search of 1920 electoral records from 1 Leicestershire, Lincolnshire and Nottinghamshire located a couple named George William Bradley and May Bradley at 22 Burgess Street in the Lincolnshire fishing port of Grimsby. Could they have been the couple who had lived at Vancouver? He appears to have served on vessels, successively, of the Royal Navy, the US Navy and the Royal Canadian Navy.